Please expand upon this. A boar atop a supine female (with a spear below her) bears little or no resemblance to the Oxford coat of arms other than the presence of a boar. On the other hand, if you can tie the translation of Ovid’s text to Oxford or Golding, then you may really have something here. Thanks. (As you can see it is not one of the “reasons” – not yet, anyway) I’ll see what I can find. At the top of the page is “Haud conveniunt.” Does that bear any significance to Oxford? Not sure. Will try to look into it. Anyone? ‘Haud conveniunt’ = “Do not agree” (per Google translate) which gives an interesting twist. As for the “a thousand miseries”, agree it could echo de Vere’s £1000 annuity. Thanks for the post, Mr. Hank!! Good point, Whittemore, but I have also to disagree: not everyone knew of Oxford’s Shakespearean secret. Apparently, only lesser but yet great authors, like Chapman or Jonson, knew of the secret. 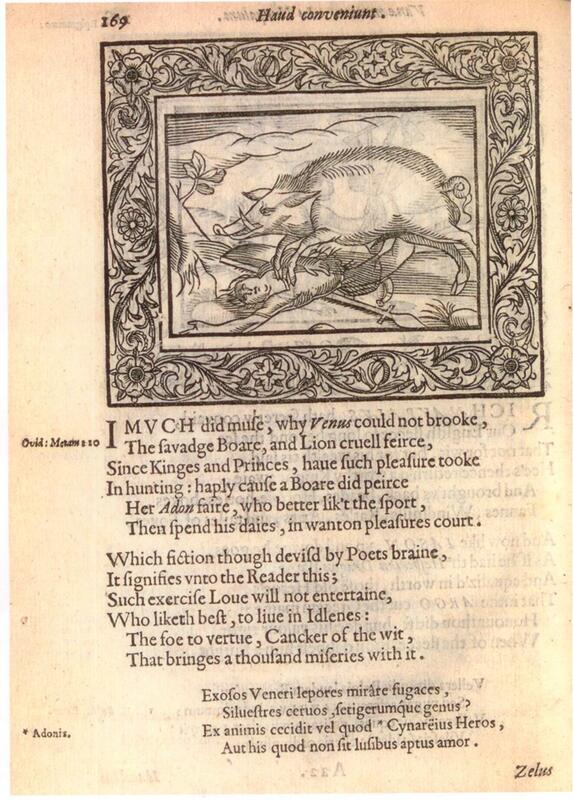 And after all, the greatest moment on a tragic love story like Venus and Adonis (not so lovely under Shakespeare’s hand, though) is Adonis’ death, killed by a boar. So, I have to say I don’t see Oxford in this page nor image. I agree, Francisco, that only certainly individuals knew of Oxford’s authorship, and also that Peacham’s drawing does not direct us to Oxford — not directly, that is. First, was it Peacham or Peacham’s father who drew the sketch of a Titus Andronicus performance (at the Swan?) in 1594 or so? One or the other — so you have him interested in plays, theater, and in Shakespeare. And in 1622 he will list Oxford among the best Elizabethan authors no longer alive. We might assume that he was interested enough in “Shakespeare” to go looking for more about him, even looking for the man himself — and finding what? And we might assume he tried to learn what he could about Oxford; and one of the first things he would find would be the boar emblem; and that Oxford was the author of plays which, so far as we know, were not identified. So let’s say he tried to learn, from publishers and authors, about both Oxford and Shakespeare. The man was involved, I’ll bet, in the authorship question! One of the first! If there had been a Shakespeare-Oxford Fellowship in 1622, or even earlier, the man would have signed up and run for president! He uses the word “vertue” echoing “ver” — which rhymes with “Her Adon faire” of line five. And winds up speaking of “a thousand miseries” echoing the thousand pound grant. All of which is by way of amusement, perhaps nothing more. If Peacham knew or suspected the answer to the Shakespeare authorship question, it may explain his “obsession” with the dramatist behind the curtain, the suggestive writing by the hand, the boar, Adon, his listing of Oxford as among the great poets — perhaps for readers in the future? Too bad we can’t ask him! perhaps Mr. Whittemore would be wise, to define more precisely whom he meant by Henry Peacham and what are the evidences beyond the printed works of Henry Peacham or H.P. ,( Analog to Shaxspere) that he really was a poet….when he lived etc…..